The last day of a desert roadtrip had me camped at the base of Turtle Mtn not far from Stoddard Wells Rd. This wide, well-maintained dirt road runs for more than 20mi through the massive OHV area between Victorville and Barstow. I was here to collect a handful of lesser peaks after having previously visiting the higher, more prominent summits in the area. Popular with motoring enthusiasts, I had the OHV area mostly to myself on a Thursday, though there were a few RVs camped at various spots and a few off-road vehicles I encountered in more than 20mi of driving throughout the area. I was up early in order to start the day and capture the first summit at sunrise. I was perhaps a bit too quick, taking little more than 10min to reach the summit up the steep south side, about 20min ahead of sunrise. A full moon was getting ready to set in the west as the sun struggled to get over the Ord Mtns to the east. Not long after returning to the jeep, I was treated to a fine, soft sunrise lighting up the clouds overhead and the San Gabriel Mtns to the south, Mt. Baldy clearly visible as the highest summit in the range. A convenient spur off Stoddard Wells Rd allows one to get within half a mile of the summit on its south side. I ascended a slope full of purple flowers on my way to the rocky summit. Reaching it by 7:30a, it was evident that yesterday's clouds had mostly left the area, leaving sweeping views and fairly blue skies. This summit overlooks the massive cement plant that lies tucked into Black Mtn at the north end of Fairview Valley. A jeep road on the north side gets one within a quarter mile of the summit, making for a very short hike. Andy Smatko had left a register here in 1988, dubbing it "Kovis Peak" and noting it as his second ascent. It is not obvious how the name was chosen. Like most of the summits in the area, Jeff Moffat had been the most recent visitor, but there were a surprising number of other entries as well. Looking west, I could see that the original highpoint of Black Mountain had been mined away long ago. This leaves the new highpoint outside the cement plant property which gave me renewed interest - Jeff had mentioned this was one he'd not done and I'd thought I'd have to leave it. I found the new highpoint outside the western edge of the cement plant. It can most easily be reached via a rough spur road coming in from Stoddard Wells Rd to the northwest. Not knowing this, I chose an alternate route up from the north, a steep jeep road that left me perched atop a ridgeline rising up to Pt. 4,175ft to the north of the highpoint. It made for a delightful hike along the ridge heading south going over Pt. 4,175ft, down to a saddle near the cement plant fence (and where I noticed the rough road coming up from the west), and a final climb up to the highpoint. It was about 2/3mi each way and less than an hour for the roundtrip effort. 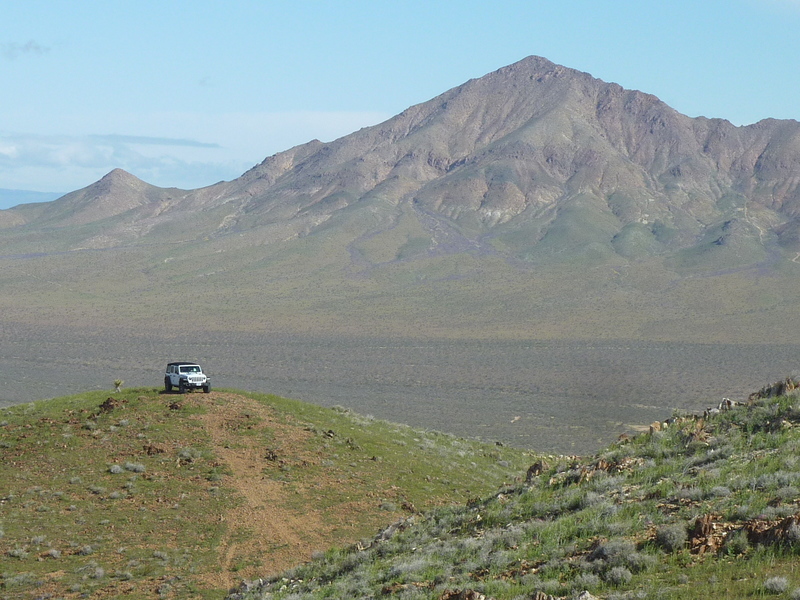 About 3mi NE of Black Mtn, a rough road gets one within 0.4mi on the south side of Peak 4,530ft. The deteriorating road continues higher to a mine below the west shoulder of the summit, but I chose not to expose the jeep to the extra abuse. There is a nice view of North Lucerne Valley to the east. I continued driving north on Stoddard Wells Rd, past the junction with Lucerne Valley Cuttoff. Both of these roads are in good enough condition that I was able to drive the van on them a few years back. I found my way to a powerline road that allowed me to get within 1/3mi on the south side of Peak 4,074ft, a short hike leading to the summit. Mark Adrian had left a register here a year ago, almost to the day. I next drove back south on Stoddard Wells Rd and then southeast on Lucerne Valley Cuttoff, seeking out this minor summit on Stoddard Ridge. I had incorrectly marked the summit on my GPSr the night before which led to a detour to visit Pt. 4,201ft. It was only after I'd gone up and down this lower summit and was back to Lucerne Valley Cuttoff that realized my error. Some quick work found a road that would get me to within a mile of the summit to the southwest, and it was to the end of this road I redirected my efforts. Someone had built a nice little campsite out here, complete with a covered sitting area, firepit, and shooting facilities, in need of some repairs. The climb took about 40min, with a neat segment along Stoddard Ridge with good views off both sides. This last summit is located just east of Interstate 15, near the Wild Wash/Sorrel Trail exit. My roundabout way of getting there avoided using the Interstate, driving a slow dirt/sand road through Turtle Valley to reach the exit via a backroad. From the freeway exit, Lois BM is about 2mi to the northeast and could easily be climbed starting from the pavement here. I chose instead to drive my way to within 1/3mi of the summit on very rough roads suitable for only the hardiest of vehicles. I'm not sure if I saved any time in the extended driving effort, but it was great fun finding my way along in the jeep. This made for another short hike where I found the benchmark atop the small summit overlooking the freeway - not a very remote feeling to this one.